Cubetto is a screen-less coding toy for kids ages 3-6. My kids have loved it and have outgrown it. Everything is in perfect condition and is from a smoke-free, pet-free house. Brand new and sealed, VTech Create-a-Story sets, lot of three:. Finding Nemo, Cars, and Mickey Mouse Clubhouse. 2 years & up. Combine basic math concepts and building play with these Giant Connecting Beads by Polydron. Great for hours of indoor and outdoor play, these giant square beads feature numbers 1-20 on one side and easily join together. I've included a few cards from other sets that I found mixed in. 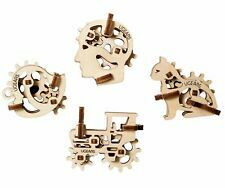 Allows children to get creative and use their imagination. Math rummy board and 24 cards. 124 Dominoes with 6 different ways to play. They will provide hours of imaginative play! 78 alphabet go fish cards. All contained in a bright green wood box with removable top lid and sliding front drawer. Brain Quest Kindergaten Deck 1 And Deck 2, Ages 5-6. Very good condition,only the box shows little bit worn,but the decks are in very good condition.It is coming from smoke free and cat friendly home. You are buying the Pre-school Brain Quest Deck 2 for ages 4-5. Pre-owned. Very good condition. 2 Used Brain Quest Kids Trivia Decks. Brain Quest Grade 2 (Revised 4th Edition). Brain Quest Extra For The Car. Five Mile Press Party ~ USA Floor Puzzle ~ puzzle size is 22.5" x 36". Go to school with Junk Food Boy "Littles Kent", Junk Food Girl "Lizzy Love" and the funny characters of LunchBox Kids! Don't land on "Couch Potato" or you will have to roll Lemons with the food dice to get out. All intact in good used condition. Normal signs of wear. LAKESHORE BINGO KITS The Addition kit is missing markers. The other kits appear to be complete (markers from other kits can be used for the addition). Two different Doron Layeled, Ltd. sealed boxes contain wooden tiles that match with wooden planks. FISHER-PRICE LITTLE PEOPLE FLASH CARDS (Set of 4). Each box contains 36 learning cards. Have fun learning colors and shapes, compare and contrast, counting 1-20, and learn your letters. Complete Deck of Cards and Carrying Bag. Model size: Helicopter: 1.2 x 1.7 x 2.0 in, Hydroplane: 2.1 x 1.4 x 2.3 in., Dirigible: 0.7 x 1.3 x 2.9 in. Airplane: 2.4 x 1.5 x 2.5 in. Number of parts: Helicopter - 15, Hydroplane - 19, Dirigible - 15, Airplane - 13. Learn order in a fun and easy way. I will do everything in my power to correct the situation. Might Mind: Aquarium Adventure, very good condition except missing one blue square. From a nonsmoking and pet free family. Mighty Mind: full set, very good condition. 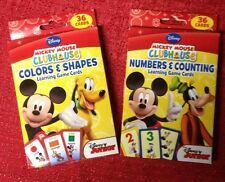 LOT of 2 Mickey Mouse Flash Cards "Colors and Shapes" &" Numbers and Counting"
(Disney® Mickey Mouse Clubhouse flash cards assorted between 2 titles: Colors & Shapes and Numbers & Counting. 1)Numbers & Counting. 2)Colors & Shapes. Pre-school Brain Quest Ages 4-5. Both decks in good used condition. IT IS IN LIKE-NEW CONDITION AND MAY BE NEW. EX-SCHOOL ITEM. ALL CARDS HELD IN ORIGINAL BOX. SPATIAL RELATION PICTURE CARDS. EX-SCHOOL ITEM. ALL CARDS AND DIRECTIONS HELD IN ORIGINAL BOX. 2-4 PLAYERS. (30 player cards). Gary Grimm & Associates. EX-SCHOOL ITEM. ALL CARDS AND DIRECTIONS HELD IN ORIGINAL BOX. School Zone Subtraction 0-12. Old Maid by School Zone. Light pen mark on back of box. Includes A glittering version of Go Fish! Includes 32 cards with holographic foil stamping, instructions, and convenient plastic draw-pile tray. TREND Shapes & Colors Pocket Flash Cards. Handy 3-1/8 x 5-1/4" size makes cards great for travel. Set includes activity ideas to challenge growing skill levels. Cards feature rounded corners for quick sorting. Eeboo Natural & Earth Science Flash Cards 48 Cards New!!! This Is New And Unused! Each set is complete. The cards are in very good condition. The boxes show some wear but are all in good condition. There are 4 sets: Seasonal sequence cards Reaction cards Sentence Sequencing 1 Sentence Sequencing 2 These cards can be used in a variety of ways, as writing prompts, speaking prompts, practice with ordering, etc. Lot Of 4 Sets DLM Teaching resources Sequencing Cards Literacy Critical Thinking. Condition is Used. Curved border features white chalk designs on a blackboard background. Brain Quest Grade 7. Content aligns with national and state standards and is overseen by the Brain Quest Advisory Board. 4th Edition - Every deck is thoroughly revised & includes 20% new material. Challenges kids on the stuff they need to know, when they need to know it. 2 years & up. The Go Wheelie is a fun and safe way to encourage imaginative and open-ended role play. Assists in developing balance and hand-eye coordination skills. Great for indoor and outdoor play. Grab your wand! With high-quality magic props and simple illustrated instructions, the 100 magic tricks in this kit can be easily learned, practiced, and mastered — to stun and amaze audiences! Dots appear and disappear in paddle tricks. Make playing cards come and go and change places. In tricks with money, currency loses value, money doubles in value, and coins disappear from a coin box and then reappear. Coins pass through handkerchiefs, disappear into thin air, and magically stay put when they shouldn’t! Paper money disappears and milk appears out of nowhere in tricks with tubes. A number of tricks involve knots and ropes: Knots in ropes untie themselves, jump from rope to rope, and disappear. A rope passes through solid objects. UGears introduces Heavy Boy Truck VM-03, the first of its kind in heavy machinery collection, tractor trailer. 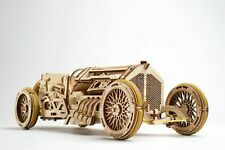 Robust and powerful, the Ugears long-hauler has a R6 engine driven by a rubber band motor. Brain Quest Grade 3rd Grade Ages 8-9 Deck One & Deck Two. Condition is Used. Shipped with USPS Media Mail. Brain Quest Grade 7 (3rd Edition). Ages 12-13 Set in Box. PUNCTUATION BINGO. TREND ENTERPRISES. AGES 6 & UP. 3 TO 36 PLAYERS. Talking interactive dinosaur. Good condition. 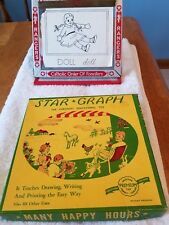 Vintage Star graph educational toy that teaches drawing writing and printing the easy way and also a hundred and one other uses. Used in box. Made by Premium Toy Mfg in Chicago. Donnie is written on box and one felt pad on bottom is missing. See pictures for more description.